I know, I know. I already did this one, but this time, I’m adding in all new, all fake episodes, too. In Cairo, mercenary Marc Spector dies under the burning sun, only the lonely shadow of a moon god to keep him company. In New York, millionaire Steven Grant introduces himself to high society and cabbie Jake Lockley hits the streets. And Moon Knight strides the streets, fist of Khonshu, protector of overnight travelers. Is he the one who lives in hearts? When Crawley tells Jake Lockley about a kidnapped girl, Mr. Knight has to pay a visit to free her. But between him and the girl, there’s a whole house full of kidnappers. Good thing Mr. Knight brought weapons. Forget the patented Netflix Marvel hallway scene. This episode is five floors full of fight scenes. There’s a slasher in Manhattan and Moon Knight must stop him before he kills again. Or is Moon Knight himself the slasher? How many minds does Marc have? 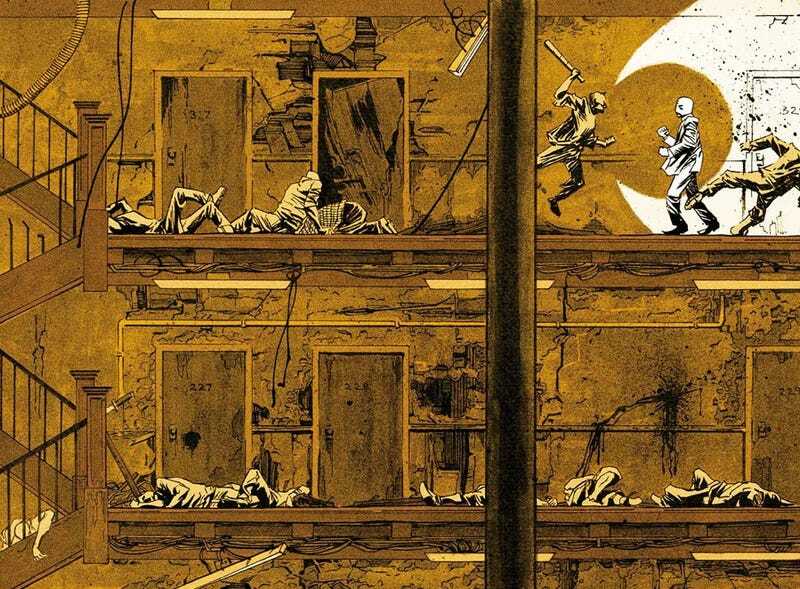 Is Moon Knight really there at all or is Marc trapped in a mental hospital? There’s a new name on the streets: Stained Glass Scarlet. A former nun-turned-mobster’s mistress, she finally had enough one night, donned a bloody cloak, and became a vigilante. As she goes on a rampage through New York, Moon Knight must decide if he will stop her...or help her. Marlene goes undercover in a Private Military Company to gain information that Moon Knight needs. But does she know exactly who she is working for? And what kind of evil organization is named Black Spectre? Halloween is here and you know what that means: Moon Knight punches ghosts. Raoul Bushman is back and determined to kill Marc Spector...again. But now he has allied with Black Spectre and seems to know more about Marc than Marc knows. Can Moon Knight stop Bushman before he takes everything away from Marc? Robert Markham used to be normal, but that was before he became Morpheus. Morpheus doesn’t need to sleep. Morpheus lives in dreams. Morpheus kills in dreams. But dreams are for overnight travelers and Moon Knight is their protector. Even Moon Knight must sleep, though. Marc’s brother Randall is in town and Marc must hide his secret identities from him. But Randall has some secrets of his own. Some dark, disturbing secrets. Moon Knight finds himself on an airplane set to explode. Is there anything more exciting? Black Spectre’s origin is revealed. The man behind the man, the head of the group, the mastermind behind Marc’s pain and misery. Two souls. Two Spectors. Only one will survive the night. Goodnight, Marlene. Goodnight, Frenchie. Goodnight, Crawley and Gena. Goodnight, Steven and Jake. Goodnight, Marc. Goodnight, Khonshu. Goodnight.